Members of Chronic Dev Team has finally announced the release of the long awaited GreenPois0n RC5. This tool brings untethered iOS 4.2.1 jailbreak for all iOS devices. Besides you do not need to have '4.2b3' SHSH blobs saved in Cydia, unlike the Redsn0w 0.9.7. Keep in mind, the software is only available for Mac OS X. A Windows version will be coming very soon. STEP 4: Once jailbroken, you'll get Cydia installed on your iOS device and you won't need to use Just tethered boot right now option anymore. UPDATE 1: GreenPois0n RC5_2 now available. It fixed bugs, including: GreenPois0n Initialized error. 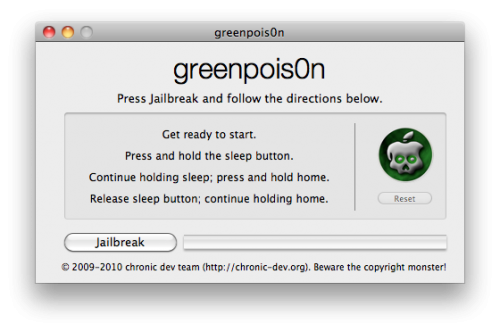 UPDATE 2: If you are already have a tethered iOS 4.2.1 jailbreak using Redsn0w 0.9.6 on your device, just run GreenPois0n over it to untether iOS 4.2.1 jailbreak.